In this very special The Simple Things ‘Gathering’ we share some ideas for celebrating the ‘the lightening of the year’, Viking style. Gather your closest com-raiders to mark the depths of winter with ‘a great shout of anger at the darkness’. Fancy a few (thousand) friends round for a simple (read: mostly booze) supper? January’s the time to celebrate like a Viking. In Shetland, they celebrate Up Helly Aa, or ‘the lightening of the year’ by getting quite angry with the darkness and lighting, feasting and revelling to really show the dark who’s boss. Don’t embarrass yourself by suggesting a departure time. A few days should cover it but if you’re doing a proper celebration we recommend you set aside 12 days and nights. If you’re expected in the office, we’d suggest you book the full three weeks off. You’ll probably need it for clearing up. If you don’t have an understanding boss, simply set the venue on fire as you leave (yes, even if it’s your house) and turn up to work with the faint smell of woodsmoke and ale about you. Job done. Forget previous beliefs about a nice ‘centrepiece’. Just slaughter every animal in sight and roast it or boil it, and stick it all out. Vikings don’t really do ‘amuse bouches’ so just sling it all on the table: stews, meats, platters of roasted veg, breads, cheeses etc… Think of it as a ‘sharing platter’ style… with little emphasis on the sharing and more on the ‘melee’ aspect. Think more ‘topple’ than ‘tipple’. You’ll be expected to serve meads, beers, ales and some fruit wines (for the ladies, perhaps). Don’t worry about glass hire. Flagons will suffice. The key with booze is quantity over quality. Be prepared for toasts. A LOT OF TOASTS. But might my guests be doing Dry January? Should I consider a playlist? A bit of Scandi Death Metal should do it. Your actual choices of artist, however, aren’t nearly as important as the ear-splitting volume at which music is delivered. Try our January Playlist if you’re stuck for ideas. And turn it up to 11. Put Trivial Pursuit away. You shall not be needing it. If you’re lucky your guests will settle for a nice game of Viking Chess or a ‘poetry-off’. But remember, it’s not about how you play the game, it’s about WINNING. If you’re unlucky, the games could be a little more, erm, brutal… One-on-one tug-of-wars known as ‘toga-honk’ are popular, as are weight-lifting, sword-fighting and even a rather jolly ‘swimming contest’ in which opponents are held underwater for as long possible. Festive! Should I expect a thank-you note? Thank yous are not generally directed to the host, more to the Gods. Have a few sacrifices on standby in case you have need of pleasing the Gods for fair weather or a good harvest, for example. A few birds and animals should do it and keep the chaps up there (or down below) happy. 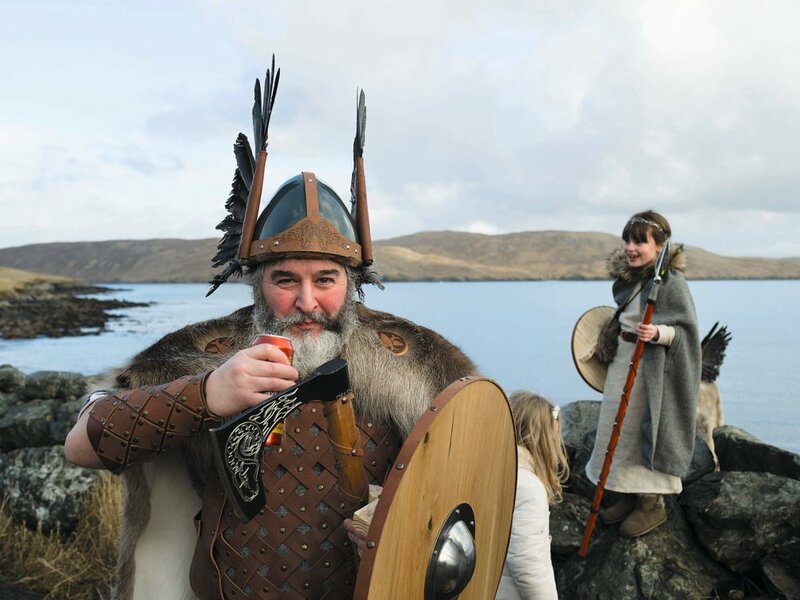 In our January issue, we are celebrating Up Helly Aa, a Viking-style feast celebrated on the last Tuesday in January in Shetland We have an extract from Shetland: Cooking on the Edge of the World by James Morton of Bake Off fame and his father Tom (Quadrille), which includes a recipe for an Up Helly Aa Hangover Mulled Ale. The issue is in shops now.